This past weekend, Roomie #1 and I got a bit over excited at the KCC farmers market. We discovered a new tomato stand and ended up buying way too many tomatoes. Ordinarily, this wouldn’t be a problem, just eat tomatoes every day for a week to use them up, but, now that the heat has hit Kaimuki, they really don’t keep very well on the counter. We have to eat them FAST since putting them in the fridge will just make them mealy and lose all their perfect farm fresh goodness. I couldn’t make salsa, we already had a bunch because, in addition to amazing tomatoes, these guys also make to die for fresh salsa (check out all the great stuff we found here: Wow Farms Inc). I am still a bit turned off of pasta ever since my too many ronies experiment, so that was out. After eating what seemed like my millionth fresh tomato with Maldon salt, I wasn’t quite sure what to do with the rest. This is a relatively unusual experience for me; I am always thinking of new foods to try. I am usually hard pressed to find time and events to make all the dishes I want to test out. My iPhone notepad is overflowing with quick snippets, blurbs, and links to recipes I want to try and modify. For whatever reason, these tomatoes had me stumped! Luckily, Roomie #1 and I had discussed having a picnic in the mountains to watch the sunset. When she texted me saying she was running late and asking if I could start the picnic prep, I hadn’t even gone shopping yet. At that point, all my dinner party/picnic instincts kicked in and I knew exactly what to do. I started grabbing all the yummy little snacks I keep around the kitchen to make a nice spread. Cheese and chocolate, of course! Garden fresh zucchini sauted with parsley and lemon, yes! The sourdough loaf I had thrown in the freezer a few weeks ago was reborn as garlic crostini. Those tomatoes I had been staring at? They got to star as a gorgeous fresh bruschetta with aged balsamic and basil. A quick stop for a bottle or two of bubbly and up the mountain we zoomed to Pu’u Ualakaa State Park (better known as the Tantalus Lookout) to catch the last rays of light over the city. Roomie #2 met us there and we all had a wonderful time watching the sunset, talking about our weekend plans, and eating a great picnic dinner. I can’t wait for another trip! 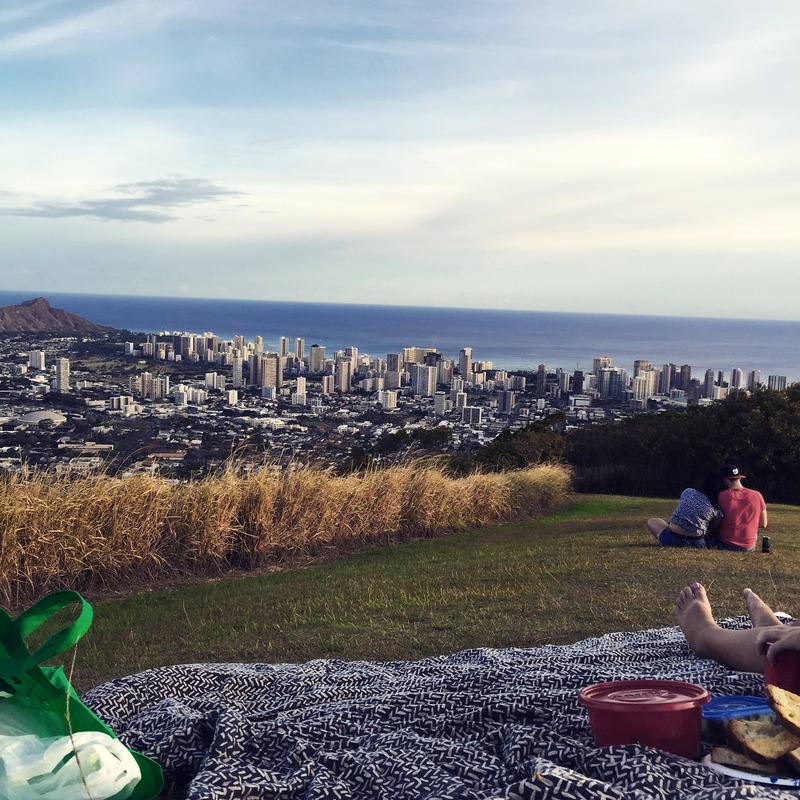 The view of Diamond Head and the city from our picnic blanket. You can almost see home! Of course I had bring the bubbly, how else does one picnic? RIGHT?! KCC Farmers Market is DA BOMB! 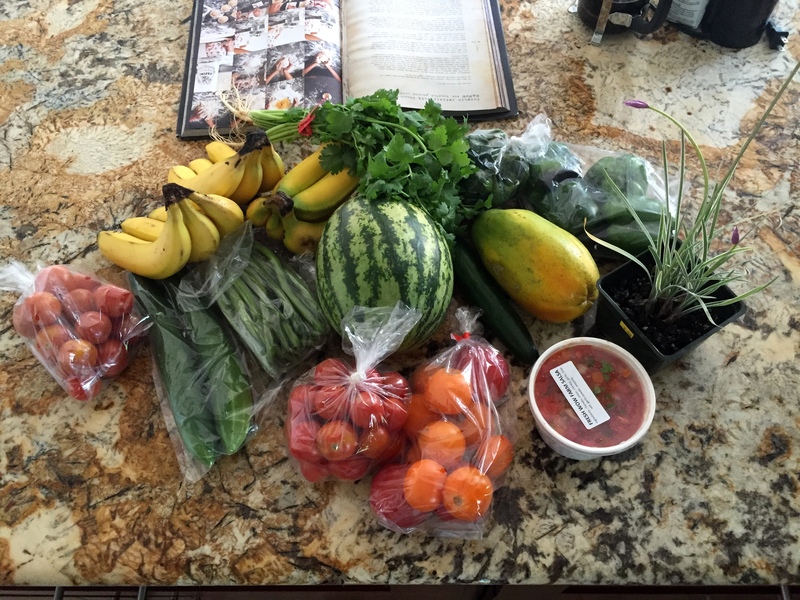 I did the same thing, bought way too much produce for the two of us to eat, but some how we did. … some how we did eat it all that is… HA! We love it! I go almost every Saturday since it is so close to home. I am always having to come up with new ways to cook all the veggies since I always manage to buy FAR too much! Love KCC farmers market and Tantalus lookout! What a great picnic. Oh what a great idea, farmers market, fresh food and eating outside! Love it! Saying hello from funtastic Fridays! Thanks so much! It was a great evening. I love getting as much of my food locally as I can. Nothing beats fresh veggies and a olive oil. Thanks for linking up and sharing with us at Funtastic Friday. Hope you join us again this week.